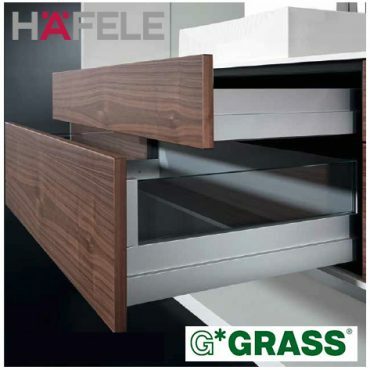 The ‘Grass Novapro Scala Package distributed by HAFELE’ from Solid Setup adds the Novapro Scala drawers to Cabinet Vision Solid V9 or later. 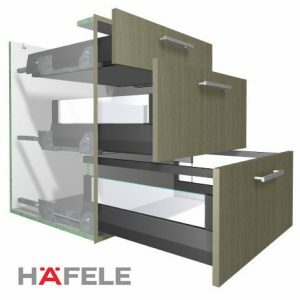 186 height drawers have 4 options – 186 sides, 90+Rail, 90 + Crystal or 186 Crystal Plus. Tipmatic Soft Close can also be activated per room or per drawer. Rear Bracket drilling can be set to screws, lugs or both. Drawers also have a variable height extra Gallery system, controlled by attribute. 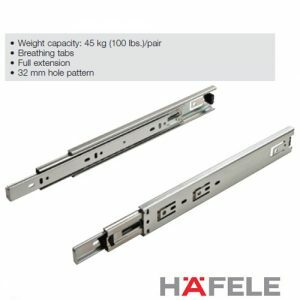 This package provides drilling for the drawer box parts, the cabinet ends and the drawer front for CNC output. It also adds 3d graphics for the drawer sides, runners, galleries and brackets etc. The Rollout fronts, soft close option and extra Galleries etc. are added as a separate parts and materials for reporting purposes. 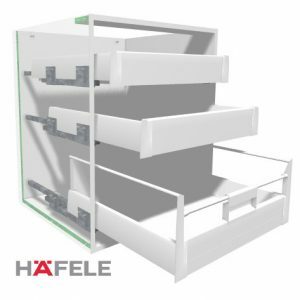 All material descriptions contain the HAFELE order number after the # symbol.